I finally have my car back for now lol....new bumper, splitter and canards have been added. Played with my pops and bangs map on EcuTek. Sounded cool and also shot some flame's according to my friend who was behind. My thought is, this can't be good for the car but I'm sure people run that map all the time so how bad can it really be? I managed to get the Z winterized and into storage. 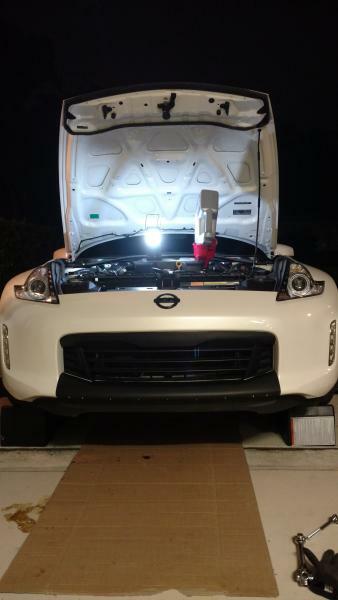 The only things I didn't complete were the oil change and to put the cover on the Z. The cover goes on tomorrow. The oil change will have to wait until spring. Dropped off my AeroWorkz 13+ front lip ( FRP/ Carbon Fiber) at the body shop for paint. Cant wait! Dropped by Austin Z Clinic today and the owner Kevin put the car on the lift rack to see if the power steering pump and lower control arm needed replacement. Of course, the dealer is full of sh!t and not needed at this time. He did recommend transmission fluid and spark plugs replaced since car has 103k miles and no telling the last time the previous owner did either if at all. I just got the car about 4 months ago and want to bring it up to date and continue using it as my DD. I work into late in the night and can not have a breakdown in some of the shady areas where the clinic and the hospitals are located. Both jobs will be done by Kevin next week. TreeSemdyZee, JARblue, Rusty and 1 others like this. I drove with a lead foot today... Well, I always do, but more so today. Bunch of morons on the road or something. Then on the way home tonight, lightly raining out, no one out on the road in either direction, I took off at one light, rolled into the throttle in 1st, then gave 2nd and 3rd hell! Had a tail happy Z for probably close to a 1/4 mile, at about a max of 50 mph, which is the speed limit anyway. Hotrodz, Ghostvette, wideglideleon and 2 others like this. Change the oil and filter, wash and wax, clean condition the inside. back in the garage car cover on. Ready for the spring, can not wait. It is about smiles per mile not miles per gallon! Rusty, Ghostvette, old guy and 2 others like this. And I'm not one to go ripping up tires either (pointless and a waste of money). But since the ole' girl decided to let lose in 2nd gear for no reason, I decided to go along with it and let her do her thing. I really need to get her on a dyno sometime and see what she's making. She's got some power under the hood for sure. Hotrodz and Ghostvette like this. Last edited by Zingston; 11-11-2018 at 08:49 PM. Picked up Art Pipes today in preparation of next year's exhaust setup. Yesterday was the dreaded "putting the car away for the season". It only takes about an hour to rearrange the garage, wipe her down, put on the wheel dollies and battery tender. My wife helps me push it into position, I throw on the cover and now have to wait about 5 months. At least we can park our other cars into the garage as the "snow season" is upon us. old guy and MplsPete like this. Was doing a general end of season detailing on Saturday and happened to be under the rear on replacing the brake bleeder caps that rotted off. Saw my diff bushing blew... Looks like I have my winter project already lined up. Hotrodz, mishuko and wideglideleon like this. Bring to the house. I can change it. Done a couple already. JARblue, Hotrodz, mishuko and 5 others like this. Install = Easy. A lot easier than I thought it would be and my mechanic level is about a 2 outta 10! Was easiest to use the stock jack, turn the wheel, lift the side up just a bit, allowed for plenty of room to get in there (midget hands would have helped)! Excited for my first night drive. The stock bulbs really go to crap after that 4.5 year mark it seems (maybe I'm just getting old). Tip: Use your cell phone to take photos to ensure you have the bulb oriented the correct way, stupid clip thing seated correctly, etc. That removed a great deal of frustration in the process. A headlamp helps a ton as well. Bulb has 2 notches, one at 12 and 1 at 1 O'Clock positions. Rusty and Ghostvette like this. Last edited by markesc; 11-12-2018 at 06:52 PM.